Techniques for determining effects on a biological system include determining rate constants for a particular time interval starting at an initial time. Each rate constant indicates a rate of transition from one of four states to a different one of the four states for a component of a biological system in presence of an external factor. A temporal change in a probability that the component is in a particular state after the initial time is determined without numerical iteration over multiple time steps. This includes determining three relaxation time constants that describe exponential changes based on the rate constants. 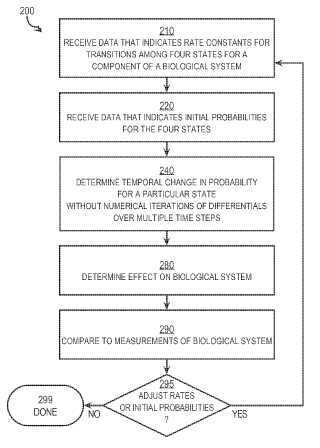 The effect of the external factor on the biological system is determined based on the temporal change in the probability that the component is in the particular state. The probability at an arbitrary time is determined based on the rate constants and initial probabilities.